Authors: Yarovoy A.A., Gorshkov I.M., Korobov E.N., Yarovaya V.A. Relevance. The endoresection of the choroidal melanoma (CM) is carried out from its top to the base with the formation of surgical coloboma within the healthy choroid visible in the operating microscope, which does not guarantee the absence of residual tumor cells in it at the microscopic level. Excision of the choroid with a large amount of healthy tissues leads to a risk of unnecessary resection of functionally significant tissues with corresponding loss of vision, especially in juxtapapillary and paramacular localization of CM. Purpose: to develop a method to increase the radicality of endovitreal removal of the choroidal melanoma while achieving the maximum functional result. Material and methods. At the basis of the “radical and sparing” endovitreal removal of CM lays the principle of micrographic Mohs-surgery used in the treatment of skin cancer. When CM of paramacular localization is mushroom-shaped, the tumor peak often hangs over the macular zone and prevents its visualization and does not allow to determine true boundaries of the CM base in this area. In this situation, it is possible to carry out an endoresection of CM under video endoscopic control. Results. According to the proposed method, 3 patients were operated: 2 men and 1 woman. All patients in the pre-operative period had exudative retinal detachment, in 1 of them it was vesicular. For the maximum period of observation, all 3 patients are alive, in none of them metastatic lesions and tumor recurrence were detected. All eyes have been preserved. The best corrected visual acuity was: in patient No 1 – 0.3; in patient No 2 – 0.4; in patient No 3 – 0.1. Conclusion. The proposed treatment method makes possible to carry out the most radical endovitreal removal of CM, which at the same time is sparing for functionally significant healthy surrounding tissues with a decrease in intra- and postoperative complications. choroidal melanoma, endoresection, endoscope, surgical coloboma, histology. 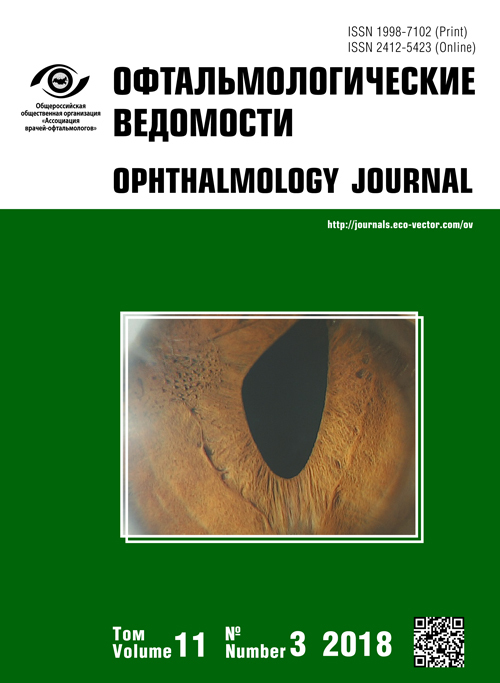 The manuscript “Radical and organ-sparing endovitreal removal of choroidal melanoma” by A.A. Yarovoy, I.M. Gorshkov, E.N. Korobova, and B.A. Yarovaya, which is going to be published in the current issue in the discussion section, caused much discussion. Considering the ambiguous opinions of experts and various approaches to treatment, we have accepted the article for publication when we received the agreement from the reviewer and authors. The authors believe that the reviewer's comments “are not completely objective because of the prejudice against the proposed method.” We are interested in the opinion of ophthalmic oncologists regarding local resection of melanoma. What do you think about this? We are ready to continue the discussion in our journal. We are awaiting your Letters to the Editor. Choroidal melanoma (CHM) is an intraocular malignant tumor of melanocyte origin arising from the choroid. It accounts for 85% of all intraocular tumors and is characterized by a progressive course with a high risk of vision loss and an extremely poor prognosis for patient survival. The CHM incidence reaches 6–7 cases per 1 million population per year . Until the mid-20th century, enucleation remained the main treatment for CHM, although it has a crippling effect. In 1978, Zimmerman et al. doubted the feasibility of enucleation as a primary treatment option for CHM. Their study facilitated the development of organ-sparing techniques for treating CHM, including brachytherapy (BT), local tumor removal, proton therapy, stereotactic radiotherapy, and transpupillary thermotherapy. Despite such a variety of treatment options, CHM therapy remains challenging because, to date, no optimal treatment has been found. Treatment of juxtapapillary and paramacular CHMs appears particularly difficult. In recent decades, surgeons have performed endovitreal removal of CHM as an alternative to enucleation and radiotherapy. This method was developed by Linnik  and, then, further optimized by others [1, 3, 4, 6, 8, 9, 13]. Damato  introduced the term “endoresection,” which currently is more widespread. Endovitreal removal of CHM can be used as a primary [7–15] or secondary [1, 3, 6] treatment after radiotherapy. Radiotherapy for paramacular and juxtapapillary CHMs with large height and small diameter is associated with a high risk of severe postradiation complications and vision loss. Current treatment strategies aim to preserve the eye (for cosmetic purposes) and visual functions as a main factor determining the quality of life. Therefore, CHM endoresection can be considered as a primary treatment. The main principles of surgical treatment for cancer are radicalism, ablastics, and antiblastics. In ophthalmic practice, compliance with these principles often is very difficult due to the small size of the eyeball and its structures and the need to preserve visual functions. Currently, endovitreal removal of CHM is performed through the pars plana of the ciliary body using 20–25 gauge (G) vitreoretinal instruments. The tumor is resected from its top to the base with the creation of a surgical coloboma within the healthy choroid, visible with operating microscope. However, this technique does not guarantee the complete removal of residual tumor cells from the choroid and, therefore, poses a risk of local recurrence and CHM metastasis [9, 11]. Excision of the choroid with a large margin of healthy tissue increases the risk of unnecessary removal of eloquent tissue and visual function loss, particularly in juxtapapillary and paramacular tumors. Our aim was to increase the radicality of endovitreal CHM removal along with achieving maximum functional results. The indications for surgery were tumor height (h) ≥ 6 mm, maximum tumor base dia meter (MDTB) < 17 mm, intraocular hemorrhage impeding visual tumor control, large tumors restricting preservation of visual functions and associated with a high risk of postradiation complications, equatorial or retroequatorial tumor location, and one functioning eye affected by tumor. All the patients underwent brachytherapy after primary CHM endoresection. All the study participants were informed about the details of treatment and provided written informed consent for surgery. Preoperative examination included evaluation of best-corrected visual acuity (BCVA), intraocular pressure (IOP) measurement, ocular biomicroscopy, indirect fundus ophthalmoscopy, A- and B-scanning to determine maximum tumor height and MDTB, fundus photography, optical coherence tomography (OCT), fluorescein angiography of the fundus vessels, and CT of the orbit. Additionally, all patients underwent ultrasound/magnetic resonance imaging (MRI) of the liver and chest x-ray/CT to identify possible metastases. No patient had metastasis at the time of surgery. Surgery technique. The first step was subtotal vitrectomy using standard 25G technology. After removing the vitreous, we performed complete tamponade of the vitreous cavity with perfluorodecalin by replacing the liquid with perfluoroorganic compounds (PFOC). Then, we performed diathermocoagulation of the retina and choroid around the CHM base visualized using an operating microscope. Thus, we created temporary ocular hypertension with IOP up to 50 mm Hg. Then, we performed retinotomy on the diathermocoagulation border with subsequent retinectomy of the area above the tumor. A vitreotome was used to remove CHM from the top to the base. We used a cutting rate of 2000 cuts/min to remove the portion of CHM facing the periphery of the fundus and 5000 cuts/min to remove the portion located closer to the fovea and optic disc (OD). To maintain ocular hypertension, we added PFOC when necessary. After CHM removal, we excised a narrow (1 mm) strip of surrounding tissues along the perimeter of the created surgical coloboma and sent it to the laboratory for histologic (cytologic) examination. Then, we performed additional excision of a narrow layer of surrounding tissue in two areas (Fig. 1): (1) surrounding tissues located closer to the macular area and optic disk (0.5 mm), and (2) surrounding tissue from the peripheral portions (1 mm). These tissue samples were marked according to their origin and sent to the laboratory for cito examination. Normal IOP was restored by partial PFOC removal. If no tumor cells were found in both specimens, we performed endolaser coagulation using a laser (wavelength, 532 nm; power, 150–250 mW) along the edge of the coloboma (for retinopexy) and along the surface of the scleral bed. Subsequently, we replaced PFOC with gas, which was later replaced with silicone oil. During the next stage, we performed BT by anchoring a β-applicator with ruthenium-106 to the episclera on the projection of surgical coloboma. The minimum absorbed radiation dose for the inner surface of the sclera was 150 Gy. If tumor cells had been detected in at least one tissue specimen, we additionally excised a narrow layer of surrounding tissues in the corresponding area and sent it for histologic (cytologic) examination. This procedure was repeated until no CHM cells were detected in the sample. Surgery was completed as described above. In the case of mushroom-shaped paramacular CHM, the top of the tumor often overhangs its base, thereby impeding its visualization and preventing determination of the true border of the CHM base in this area. In this case, we recommend performing retinal and choroid diathermocoagulation as follows: the first stage should include diathermocoagulation of the retina and choroid around the MCH base borders that are visible with operating microscope. Then, an additional port should be installed through the pars plana of the ciliary body. This port is used to introduce the ophthalmic endoscope tip, which is brought to the MCH base border, invisible with operating microscope. Then, endoscope-controlled diathermocoagulation of the retina and choroid is performed around the CHM base (Fig. 2). Other stages of primary CHM endoresection are conducted as described above. All the participants underwent postoperative ophthalmologic examinations every 3 months and screening for metastasis, including liver ultrasound/MRI, every 6 months and lung CT scans once a year. Patient characteristics. Three patients (two men and one woman) underwent surgery via the aforementioned technique. Table 1 provides detailed patient information. All patients were diagnosed preoperatively with exudative retinal detachment (one had bullous detachment). Anatomic and functional results. We preserved eyes in all the three patients. The best-corrected visual acuity at the latest visit was 0.3, 0.4, and 0.1 in patients 1–3, respectively (Fig. 3). Рис. 3. Фотографии глазного дна до и после первичной эндорезекции меланомы хориоидеи: а — до лечения; b — через 18 мес. Surgical complications. During the postoperative period, one patient had cystoid macular edema, which can be attributed to a close location of the surgical coloboma margin and choroid to the macular area. Three to six months postoperatively, all patients underwent phacoemulsification with intraocular lens (IOL) implantation and silicone removal. Histologic and chromosomal analysis. Histologic analysis of tissue from the main CHM focus demonstrated a mixed-cell tumor in one patient and spindle cell tumors in two. Histologic evaluation of the resection margin showed no tumor cells. Cytogenetic testing demonstrated chromosome 3 monosomy in one patient (25%–30%). Local recurrence, metastases, and death rate. By the latest follow-up visits, all the patients were alive; none had metastasis or CHM recurrence. CHM endoresection using an ophthalmic endoscopic system for diathermocoagulation of the retina and choroid was tested on five enucleated eyes with stage T3-4N0M0 CHM, when the top of the tumor overhung its base. Using an endoscope, we visualized the border of the tumor base in all eyes and performed diathermocoagulation along this border. We also preserved the fovea during additional excision of a 0.5-mm strip of adjacent tissue in all five cases. Histologic examination demonstrated no tumor cells in adjacent tissue. Our method allows for maximum possible endovitreal removal of CHM along with preserving adjacent healthy tissue and decreasing the number of intra- and postoperative complications. This technique can be used as an alternative to radiotherapy in patients with juxtapapillary and paramacular CHMs to ensure preservation of visual functions. Since our study has few participants and a relatively short follow-up, further patient recruitment and longer follow-up are needed. Bell DJ, Wilson MW. Choroidal melanoma: natural history and management options. Cancer Control. 2004;11(5):296-303. doi: 10.1177/107327480401100503. Bornfeld N, Talies S, Anastassiou G, et al. Endoscopic resection of malignant melanomas of the uvea after preoperative stereotactic single dose convergence irradiation with the Leksell gamma knife. Ophthalmologe. 2002;99(5):338-344. doi: 10.1007/s00347-002-0647-4. Caminal JM, Mejia K, Masuet-Aumatell C, et al. Endoresection versus iodine-125 plaque brachytherapy for the treatment of choroidal melanoma. Am J Ophthalmol. 2013;156(2):334-342 e331. doi: 10.1016/j.ajo.2013.03.036. Damato B, Groenewald C, McGalliard J, Wong D. Endoresection of choroidal melanoma. Br J Ophthalmol. 1998;82(3):213-218. doi: 10.1136/bjo.82.3.213. Garcia-Arumi J, Leila M, Zapata MA, et al. Endoresection technique with/without brachytherapy for management of high posterior choroidal melanoma: extended follow-up results. Retina. 2015;35(4):628-637. doi: 10.1097/IAE.0000000000000379. Karkhaneh R, Chams H, Amoli FA, et al. Long-term surgical outcome of posterior choroidal melanoma treated by endoresection. Retina. 2007;27(7):908-914. doi: 10.1097/IAE.0b013e31802fa2db. Konstantinidis L, Groenewald C, Coupland SE, Damato B. Long-term outcome of primary endoresection of choroidal melanoma. Br J Ophthalmol. 2014;98(1):82-85. doi: 10.1136/bjophthalmol-2013-304022. Kertes PJ, Johnson JC, Peyman GA. Internal resection of posterior uveal melanomas. Br J Ophthalmol. 1998;82(10):1147-1153. doi: 10.1136/bjo.82.10.1147. Peyman GA, Barrada A. Retinochoroidectomy ab interno. Ophthalmic Surg. 1984;15(9):749-751. Rice JC, Stannard C, Cook C, et al. Brachytherapy and endoresection for choroidal melanoma: a cohort study. Br J Ophthalmol. 2014;98(1):86-91. doi: 10.1136/bjophthalmol-2013-304006. Susskind D, Durr C, Paulsen F, et al. Endoresection with adjuvant ruthenium brachytherapy for selected uveal melanoma patients - the Tuebingen experience. Acta Ophthalmol. 2017;95(8):e727-e733. doi: 10.1111/aos.13306. Zimmerman LE, McLean IW, Foster WD. Does enucleation of the eye containing a malignant melanoma prevent or accelerate the dissemination of tumour cells. Br J Ophthalmol. 1978;62(6):420-425. doi: 10.1136/bjo.62.6.420. Copyright (c) 2018 Yarovoy A.A., Gorshkov I.M., Korobov E.N., Yarovaya V.A.